During the past year information technology services, the K-State ID Center, and office of the registrar developed new processes to enable student photos taken by the ID Center to be imported and displayed in iSIS. Q/A: How to save photos from a broken cellphone? My cellphone quit working and it has a lot of photos I want to keep. How do I save them? One easy solution is to take the camera’s memory card and a flash drive or blank DVD to the Media Development Center (213 Hale Library). Use one of the card readers there to transfer photos and videos to your media. Staff consultants are on hand to walk you through the process. Check out pixenate.com, a simple, web-based photo editor. How does it work? Upload your photo to the website. Edit using any one of a number of photo-editing tools, including cropping, color balance, resize, rotate, and more. The edited photo can be saved or uploaded to a website such as Flickr. 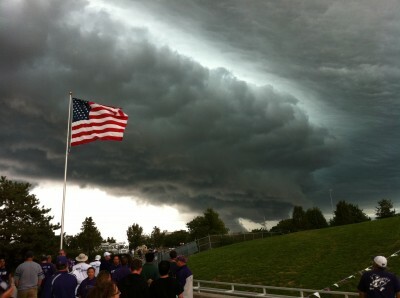 The editors couldn’t resist sharing a picture from Saturday’s (Sept. 25) thunderstorm about three minutes into the start of the K-State football game in Manhattan. The picture below was taken by Eric Dover, manager of Client Services in iTAC, using an iPhone 4. It illustrates the advantages of high-quality cameras in newer cellphone technology.